Swingline 100M Micro Cut Shredder is an executive level paper shredding product that is built to deliver speed and quality even in high volume work environments. 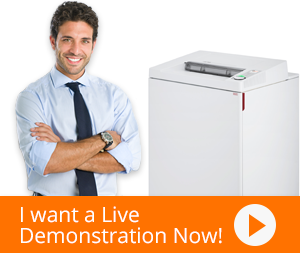 With its impressive P-5 level security and automation features, its surely is a shredder worth buying. It has an Auto Feed unit that can shred up to 100 sheets automatically; the operator only needs to stack them in the feeder. A simultaneously functioning manual feed is also in place so side-jobs can be performed easily when the automatic shredding is in action. Swingline 100M has hardy cutting knives that can effortlessly shred materials like paper clips, staples and credit cards. Among other of its fantastic features are Auto Jam Clearance, that removes jamming in the knives automatically, and its Auto Cleaning feature that cleans the blades regularly to prevent jamming. Furthermore, the 100M Micro Cut Shredder is highly conducive to an office environment due to its ultra low level of noise and energy efficiency. Its Intelligent Power Save feature is programmed to activate sleep mode when the shredder is not being used, leading to substantial energy saving, and a great experience for users.